Vada's Blog Stamp Inks and Paper : Acetate Frost w/ Alcohol Inks from Feb. 2010 Newsletter. Acetate Frost w/ Alcohol Inks from Feb. 2010 Newsletter. For Gingersnaps Creations Challenge No. 58, is Transparencies. My image was stamped w/ StazOn and is from Stampers Anonymous. 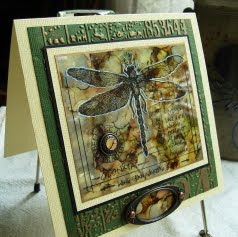 The embossing folder is from Sizzix, (The Tim Holtz Alterations). Alcohol inks in colors of, Lettuce- Butterscotch- Stonewashed- Currant. Oh Vada, that's stunning! Love the colors you chose! This is just amazing with the wonderful colour scheme and all the details. *gasp! * This is positively stunning! 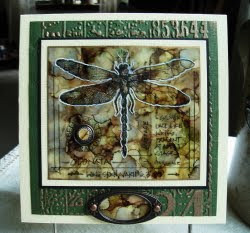 I love your alcohol ink treatment, with that amazing dragonfly floating on top. The embossing goes along with it so wonderfully, too. Everything about it is so beautifully done! stunning! i am so impressed with your take on the transparency challenge as well as the use of alcohol inks. the end result is just the best. Super big WOW! This is absolutely gorgeous!! Wow, this is SPECTACULAR! I just love the colors you used, really stunning. This is amazing! Thanks for joining us at Gingersnap Creations! I already commented on the beauty of your card, so Congratulations for being a Ginger Gem! As you might have guessed everyone who has seen this thinks it is stunning and gorgeous, as do I. I love it!